Fire Extinguisher certificate and requirements -If you are just starting out in the food business or if you are conducting commercial activities like a restaurant or cafe that require a gas or flames, also other public places, petrol pumps,factories,cinema halls etc. then you need to apply for a NOC from Fire department. The full rules and regulations including the format request letter regarding that are mentioned in the link above. One of the main conditions of the NOC when allotted to you is that you need to have two fire extinguishers on the premises preferably near an entrance or exit. These have to be of 5 kgs each and also need a certificate to show its maintenance dates, fitness ,registration, refill and inspection dates. 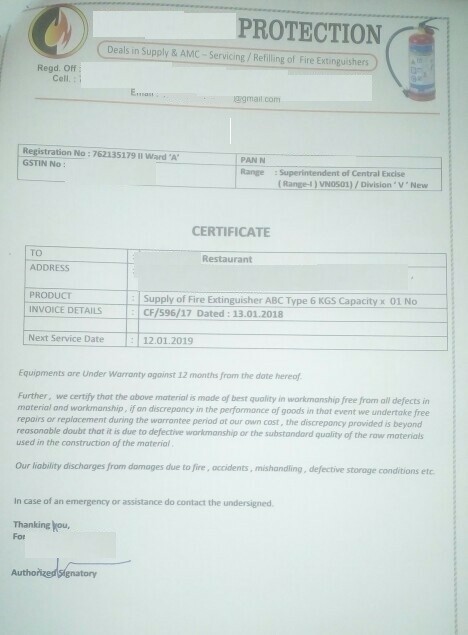 This Fire Extinguisher certificate and requirements is of prime importance else when the fire officer comes for routine testing and checks the fire extinguishers, this certificate will serve as proof. This fire extinguisher needs to be refilled and maintained and checked at least once a year.The best type of extinguisher that you need to have is the ABC type.This is good for solid,liquid,gaseous and oil /fuel based fires.It is called a dry chemical powder based fire extinguisher.It is pressure sealed and comes fitted with a pressure gauge. If they are not refilled once in a year then not only will your certificate be null and void, but also the dry powder inside becomes caked up and will not be able to stop any fire when sprayed. Once this type of extinguisher is sprayed,it empties all the contents of the cylinder out at one shot. Above is a certificate that is given with each refill of the cylinder to show its next refill date and its authenticity.Make sure you have this certificate in place and ready to show anyone from either municipality or fire brigade, else you can even have your licenses suspended.